Jerome Myers is best known for his paintings of New York City life during the opening decades of the twentieth century. Described as "the gentle poet of the slums," Myers found beauty and a poetic grandeur in the simple, ordinary life of the common man. He was, in fact, one of the first artists to explore and subsequently paint the life of the urban poor in this country. Robert Henri, the noted city realist and leader of the "Ashcan School," echoed Emerson's nineteenth-century challenge to American artists when he stated, "There is only one reason for the development of art in America, and that is that the people of America learn the means of expressing themselves in their own time and in their own land ... what we do need is art that expresses the spirit of the people of today." Myers firmly adhered to this philosophy and painted canvases that revealed his deep and abiding respect for the unpretentious life of the masses. From the frenetic activity of the marketplace on New York's Lower East Side to the restful moments spent at the end of the city's numerous piers, and from the multifarious joys of childhood to the quiet dignity of old age, Jerome Myers captured the low, the familiar, and the common in urban American life. Myers' contribution to the history of American art was significant. While pioneering new thematic materials in American art, Myers also actively participated in several progressive art organizations that helped encourage and develop new directions in American art. He was, for example, one of the four original founders of the 1913 Armory show, considered to the the most significant art exhibition ever held in this country. Born in Petersburg, Virginia in 1867, Myers lived in Philadelphia, Baltimore, and New Orleans before he established residence in New York City in 1886. Within a year, he had enrolled in his first formal art courses at Cooper Union and, shortly thereafter, the Art Students' League, where he studied with George de Forest Brush and Kenyon Cox, both competent and learned academicians. However valuable the technical training and discipline, the young artist questioned the highly structured, conservative nature of these institutions. According to Myers, his instructors frowned upon his interest in city life. "Brush did not believe in doing the crowd," he wrote, "but to me the importance of group life became a guiding star." Responding to this impulse, Myers set out to interpret the life of the city for himself: " If ever I was to create beauty I know that it would not be by imitating the classical Greeks of Michael Angelo but by expressing what was in me, as they had expressed themselves." Travels to Europe in 1896 and 1914 reaffirmed the artist's conviction that only the city life of New York could furnish the material for his life's work. He painted and sketched genre scenes in London and Paris but always preferred the immigrant life of New York City. He stated, "When they merge here with New York something happens that gives them vibrancy I didn't get in any other place." It should be noted that Myers' arrival in New York in 1886 coincided with the immigration of thousands of East Europeans to America. New York's Lower East Side became a haven for the newly-arrived immigrant, and Myers developed, almost immediately, a keen sensitivity toward the poor and the dispossessed of the city. His vision of ghetto life seldom, if ever, evoked a sense of wretchedness. "Others saw ugliness and degradation there," he wrote, "I saw poetry and beauty." 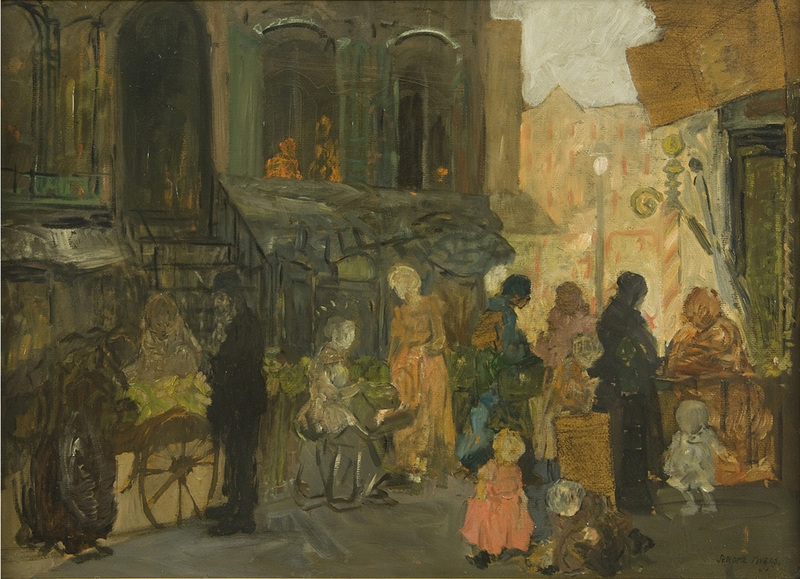 Jerome Myers had his first one-person show at the Macbeth Gallery in 1908 and exhibited nationally throughout his lifetime. He received many awards, including ones at the National Academy of Design and at the Carnegie Institute, and had several important museum purchases, the Metropolitan Museum of Art acquired a painting in 1912. In 1929, he was elected to the National Academy. Although he achieved this degree of recognition, he was not financially successful; his wife, Ethel, who was also an artist, supplemented the family income through dress-designing. Myers died in New York in 1940. Biographical information abridged from an essay by Grant Holcomb III.